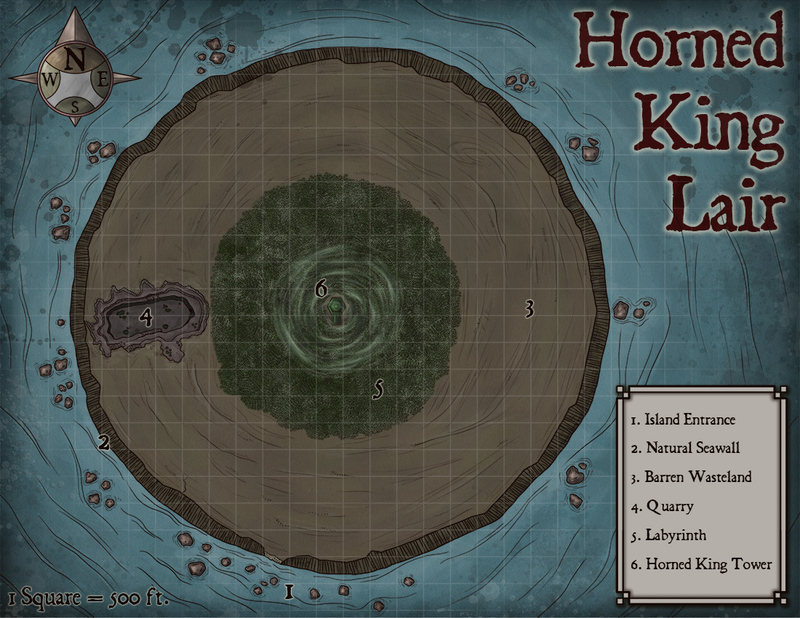 This resource features the general description of an island location where a minotaur king built a fortress. It includes adventure ideas that are appropriate for high-level (Levels 11 to 15) adventuring parties. Challenge Rating (CR) is calculated using a party of four as the model. Stats for a minotaur king are included too. Tarun used to be a regular minotaur. He was part of a big warring tribe of minotaurs in the Underdark. His tribe, like many others, had very few rules. The most important rule in the Underdark is: Either you are strong or you are dead. In the minotaur tribes, the strongest always prevail and lead. Tarun was stronger and bigger than the rest of his kin but despised because of the white coloration of his fur. Without the others’ respect, Tarun was bound to fail. One fateful day, he led the charge against an army of trolls and ogres. The bloody battle lasted for days, both sides sustained heavy losses, but none dared quit. On the fifth day of battle, Tarun charged and attacked his enemies once more. He felt a rage stronger than he had ever felt anything else. The fury ran through his veins to every part of his body, fueling it. Like an overgrown river finally destroying a dam. His axe fell on monsters, heads flew, blood sprayed. Finally, there was nothing around him alive. He had even beheaded fellow minotaurs. All dead things surrounded him. His friends and enemies stopped fighting and looked at him with fear. Two magical runes appeared in his arms. The runic language was unknown to most minotaurs but they knew these two runes. One of them meant fury, and the other one meant Baphomet. Oral tradition taught them that every so long, a minotaur was chosen by Baphomet himself to lead their race to higher heights. Other chosens of Baphomet were the stuff of legends and epic stories. And there was Tarun, a chosen of the Horned Demon Lord. Minotaurs went home victorious that day. The current leader was dead and all other members of the tribe had no choice but to kneel before the albino minotaur. News traveled fast and other minotaurs came from other tribes to join his group. Tarun unified many tribes into an army. For many years Tarun’s deeds only affected those who live in the Underdark. One day he acquired a crystal orb. The orb’s magical powers allowed Tarun to open a rift in the fabric of the space. The portals lead to any place he wished in the material plane. He could move his army almost instantly to his enemies’ doorsteps. Traveling this way he found a remote island surrounded by a high seawall. The island was the perfect place to build his own fortress; away from everything and easy to defend. His army of minotaurs worked day and night to build a great tower for their king. But this was not enough, minotaurs have an inexplicable attraction for mazes and labyrinths. The minotaurs emptied the quarry of green rock and built a gargantuan maze of pillars. Tarun’s tower is surrounded by almost half a mile of pillars in every direction. Tarun’s island is an elevated expanse of land in the middle of the sea. The seawall surrounding the island is almost sixty feet high all around except in a single spot. There is a part of the seawall that features a pass similar to a goat-trail (marked 1 on the map), adventurers can climb to the top through this pass unimpeded. There are guards on watch on top of the pass, the adventurers will have to deal with them. Characters wishing to climb the seawall in any other location to avoid attracting attention will have to approach by swimming. Boats tend to break on the rocky surroundings of the island. The open part of the island is a barren wasteland. The only thing of notice here is the quarry. The mineral qualities of the rocky island give rocks a green color. Minotaurs dug this quarry in a spiral shape, each passage, and terraces deeper and deeper. The materials for the pillar labyrinth came from the quarry. The pillar labyrinth is a dangerous place. Minotaurs naturally find their way across it but other races do not fare so well. The pillars are made of smooth green rock. Their heights range from 30 to 50 feet. Navigating the labyrinth is not easy. The minotaurs built it to confuse invaders. If the adventurers enter the labyrinth, they must succeed a DC 16 Intelligence check three times to find their way to the center of the labyrinth. A failed check means a combat encounter occurs with minotaur soldiers. A successful DC 18 Strength (Athletics) check lets a character climb a pillar. Using climbing gear grants advantage on this check. Navigating the labyrinth on top of the pillars is easier on the mind but harder on the body, not all pillars are the same height. A lot of jumping and climbing is necessary, only the fittest would try this alternative. The average horizontal distance between each pillar is 15 feet. Tarun is a minotaur king with a great army. This quest is appropriate for high-level adventurers. Since the scope of adventures such characters have is big, the DM should not use these ideas for random encounters. This is more suited as part of a longer adventure arch. Tarun has a magical orb that lets him cast a Gate spell and teleport his army. This is really dangerous. The minotaur army can come out of nowhere and storm a city from inside. Tarun can open the portal inside a settlement, attack it, steal stuff and get out in the same way. This poses a level of threat that even big settlements will fear. Kings and nobles will turn to strong heroes who have proven their worth in the past. The party has no way to fight this minotaur army when they attack. Even if they are present when a city is attacked, all they can do is contain some minotaurs and defend a small part of the settlement. Before they know, the minotaurs will have retreated through a gate. Tarun can only be defeated in his lair, and there are only two ways to get there. Either the party slips through a portal as the minotaurs retreat. Or they find the island and travel or teleport there. Finding the lair can be a whole quest on itself, requiring investigation, bribing, torturing and scrying. 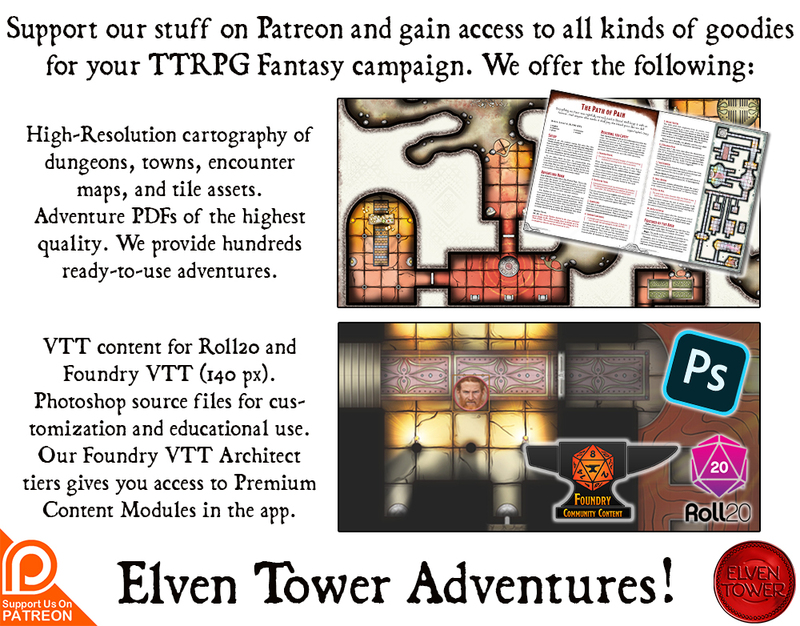 This adventure is presented in pretty PDF format for my followers on Patreon, consider checking out my page and pitching in to support the creation of more of this.